Tofu, or bean curd, is a soft white food made by coagulating soy milk, and then pressing the resulting curds into blocks. It is of Chinese origin, and part of East Asian and Southeast Asian cuisine such as Chinese, Japanese, Korean, Indonesian, Vietnamese and others. 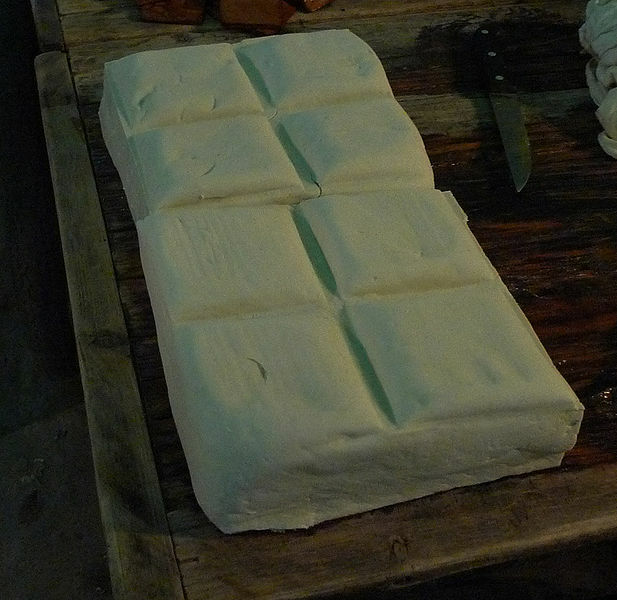 Left: Tofu block sold in markets from China to South East Asia. There are many different varieties of tofu, including fresh tofu and tofu that has been processed in some way. Tofu has very little flavor or smell on its own, so it can be used either in savory or sweet dishes, and is often seasoned or marinated to suit the dish. Tofu is low in calories, contains a relatively large amount of iron and contains little fat. Depending on the coagulant used in manufacturing, the tofu may also be high in calcium and/or magnesium. 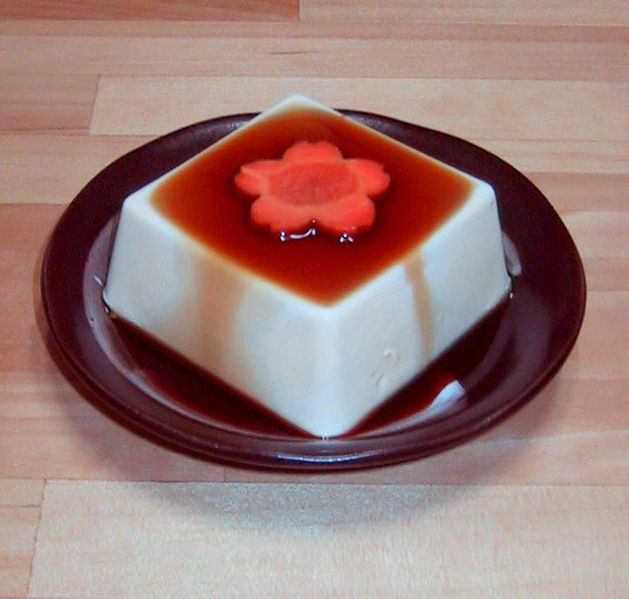 Tofu is made by coagulating soy milk and pressing the resulting curds. Although pre-made soy milk may be used, most tofu producers begin by making their own soy milk, which is produced by soaking, grinding, boiling and straining dried (or, less commonly, fresh) soybeans. Despite the daunting variety, tofu products can be split into two main categories: fresh tofu, which is produced directly from soy milk, and processed tofu, which is produced from fresh tofu. Tofu has very little flavor or smell on its own. Consequently tofu can be prepared either in savory or sweet dishes, acting as a bland background for presenting the flavors of the other ingredients used. As a method of flavoring it is often marinated in soy sauce, chilis, sesame oil, etc. In Asian cooking, tofu is eaten in myriad ways, including raw, stewed, stir-fried, in soup, cooked in sauce, or stuffed with fillings. The idea of using tofu as a meat substitute or vegetarian dish is not common in East Asia. Many Chinese tofu dishes include meat. Left: Tofu with soy sauce and a carrot in a decorative cherry blossom shape. In Western cooking, generally, the firmer styles of tofu are used for kebabs, mock meats, and dishes requiring a consistency that holds together, while the softer styles can be used for desserts, soups, shakes, and sauces. Firm western tofus can be barbecued since they will hold together on a barbecue grill. These types of tofu are usually marinated overnight as the marinade does not easily penetrate the entire block of tofu (techniques to increase penetration of marinades are stabbing repeatedly with a fork or freezing and thawing prior to marinating). Grated firm western tofu is sometimes used in conjunction with TVP as a meat substitute. Softer tofus are sometimes used as a dairy-free or low-calorie filler. Silken tofu may be used to replace cheese in certain dishes (such as lasagna). Tofu and soy protein can be industrially processed to match the textures and flavors to the likes of cheese, pudding, eggs, bacon etc. Tofu's texture can also be altered by freezing, pureeing, and cooking. In the Americas, Europe, Australia and New Zealand, tofu is frequently associated with vegetarianism and veganism as it is a source of high-quality, non-animal protein. 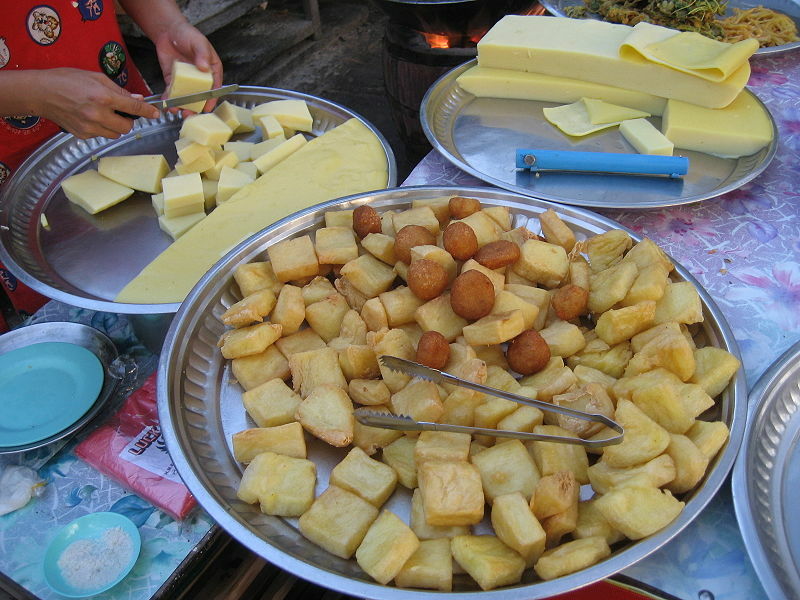 Left: Burmese tofu, fresh ready to be eaten as a salad or fried (tofu fritters shown here with a few potato fritters on top).